Apocalypse awakens as the X-Men hunt down X-Force. As Beast & Moira MacTaggert work to treat the techno-organic virus attacking Xavier, Storm & Havok split the combined X-Men & X-Factor into two teams: one to hunt down X-Force in the hopes of finding Cable, the other to find Apocalypse's Horsemen, in the hopes of rescuing Cyclops & Jean Grey, while Bishop opts to stay behind and guard Xavier. Meanwhile, Mr. Sinister trades the captive Cyclops & Jean Grey to the MLF in exchange for a mysterious canister, while X-Force's ship crashes after fleeing their encounter with X-Factor, prompting them to call for the rest of their team. In Egypt, Apocalypse is awoken by the Dark Riders, who tell him his Horsemen have kidnapped Cyclops & Jean Grey in his name. In space. Cable returns from the future to Graymalkin, where he learns someone impersonating him has shot Xavier. 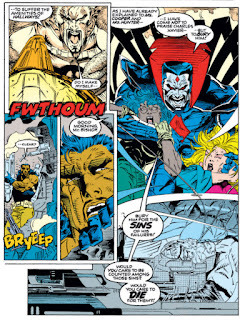 At the X-Mansion, Mr. Sinister suddenly appears, telling him he's come to bury Xavier, while in West Texas, the X-Men Blue team & X-Factor track down X-Force's crashed vehicle, only to find the entire group waiting for them, as Cannonball declares that while they don't want a fight, X-Force is more than ready to give them one. This issue marks the debut of Andy Kubert as the book's new regular artist, fresh off his breakthrough stint as penciler of Ghost Rider (a high profile book at the time, eclipsed, arguably, only by the X-books). He will remain as the book's main artist, along with a fairly regular assortment of fill-in artists, until issue #59, outlasting Fabian Nicieza on the series. His work here (and in the rest of the story) is fairly rough, relative even to his later work on the book, either a result of him still being a young and raw artist at this point, or just the result of a time crunch, given the turnaround time for this crossover relative to the Image Exodus. After Mr. Sinister in the previous chapter, this introduces Apocalypse to the story, rounding out the trip of "main" villains to be featured. This is actually the first time we've seen Apocalypse since his apparent death in X-Factor #68, something that never really dawned on me as a kid (kind of like how I was subconsciously unaware of the gap in Mr. Sinister appearances between X-Factor #39 and #75), since Apocalypse was already considered a staple of the X-Men rogues gallery, showing up on trading cards, as action figures, and whanot. 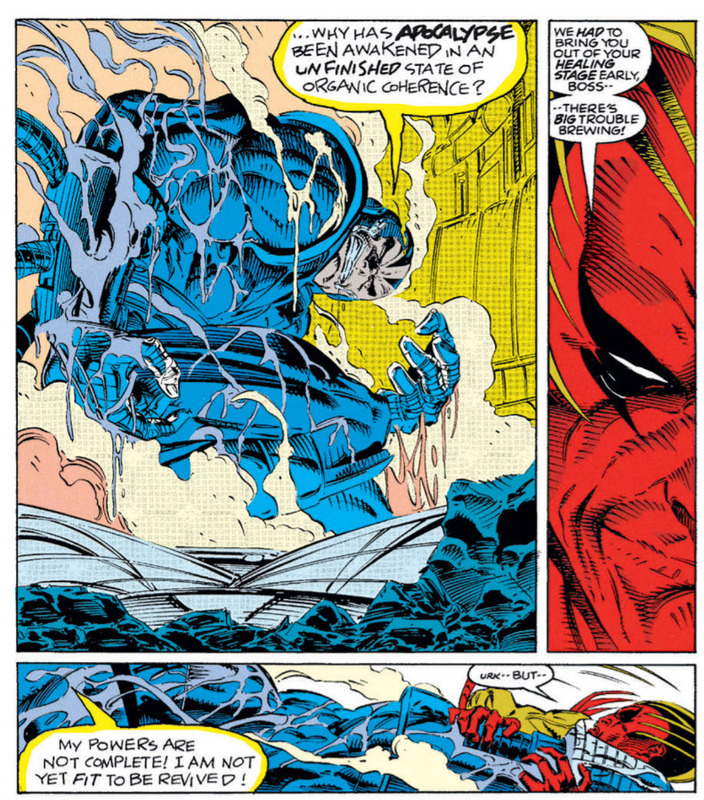 This issue also introduces the idea that Apocalypse's resurrections are part of routine process in which he regenerates following an apparent death/defeat; here, he complains of being awoken too early, before he's finished cooking, so to speak, and is weaker than normal as a result. This idea will be developed further in future stories, going so far as to suggest that Apocalypse is constantly looking for stronger mutants to serve as his "host" body, an idea later used for his cinematic counterpart. Apocalypse's connection to ancient Egypt, briefly referenced during "Fall of the Mutants", is also reinforced here, as he is revived inside a pyramid in that country. This will also become an important of his character moving forward. 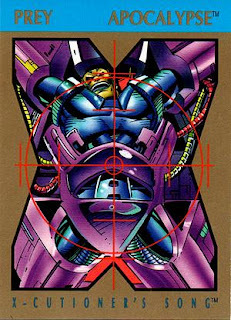 Appropriately enough, Apocalypse is featured on this issue's trading card. Along with Apocalypse, his latest group of henchmen from his previous X-Factor story, the Riders of the Storm, return this issue, being the ones responsible for resurrecting him. Here, they are called the much-less-of-a-mouthful "Dark Riders", the name that will stick for later appearances and by which I've always known them. 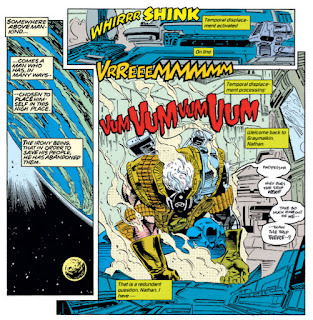 Cable returns to the present day here, coming back from the future timeline where he took Kane in Cable #2, and immediately learns that someone tried to kill Xavier while impersonating him. 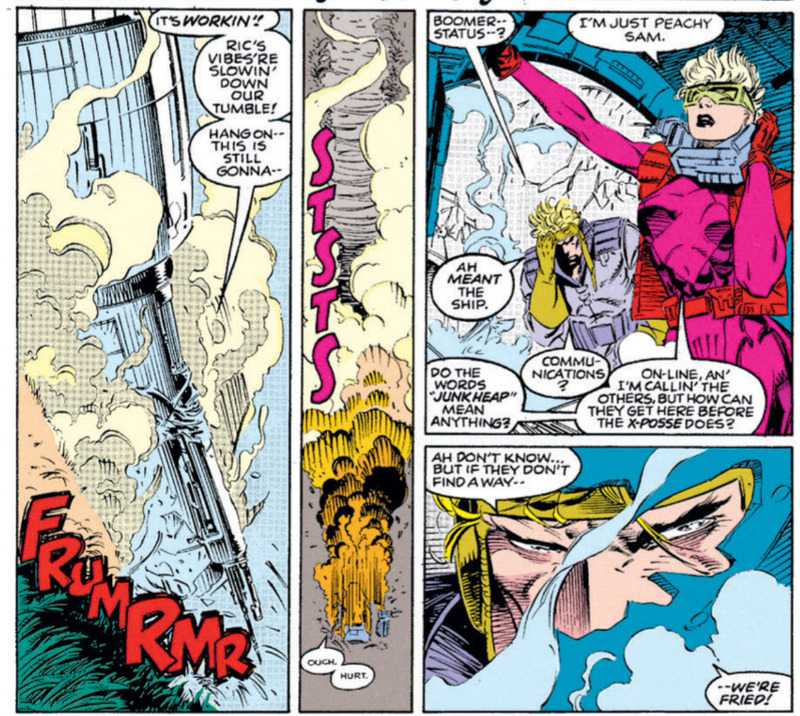 Again, it hasn't been explicitly stated yet that was Stryfe, but this issue puts that idea out there for anyone not already assuming as much. Cyclops and Jean Grey trade hands this issue, as Mr. Sinister trades them to Stryfe in exchange for a mysterious canister. Said canister will later turn out to contain the Legacy Virus, but before then, we'll learn that Mr. Sinister believes he's getting Summers generic material in the canister. Which, of course, introduces this story's biggest plot hole: why Mr. Sinister trade Scott SUMMERS for Summer genetic material. There's a number of possible No-Prize-y explanations (like Sinister wanting future Summers material, or knowing Stryfe is related to Cyclops and Madelyne Pryor so he specific wants his DNA to see how his creation turned out, or the material being more comprehensive than just having Cyclops' DNA, which Sinister has had access to for years), but the story never really addresses this, beyond Sinister's vague claims that he now possesses the future (which could be read as his wanting Summer DNA further down the lineage from Cyclops'). With Xavier back at the mansion, Moira is brought in to help Beast treat the virus (here via screen, but she'll physically come to the mansion soon). Nicieza does one of things I always appreciate happening in a shared universe, offering up an in-universe explanation for why other characters aren't involved in a given story with a scope that should affect them. Here, Val Cooper asks about bringing in Hank Pym or Reed Richards to help, to which it's suggested that there's nothing they can do that Beast & Moira can't (which is, perhaps, short-sighted - four genius heads are better than two, right? - but I appreciate the effort). 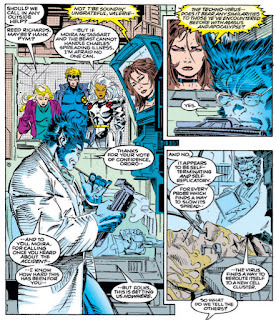 Beast has for a long time been portrayed as intelligent and general science-y, but beginning in this story with his role as one of the people trying to heal Xavier, he will be portrayed more and more often across both X-Men titles in a medical role, especially as the Legacy Virus storyline ramps up and he becomes one of the chief figures trying to cure it. Remember Stevie Hunter? 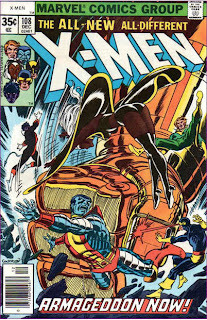 Last seen being menaced by a Shadow King-controlled Colossus in Uncanny X-Men #279, she pops up here somewhat randomly, as a hostage of Mr. Sinister (along with Val Cooper) at the very end of the issue, though she'll stick around for a few more chapters as well. The cover of this issue has been used as the cover of several collected editions of this story. On the opening page, the recap narration declares that Cyclops & Jean Grey were captured by the Four Horsemen of Apocalypse. There were, in fact, only three of them. The X-Men's past experiences with techno-organic viruses, both of the Magus variety and the one Apocalypse used to infected Cyclop's son, are referenced. Similarly, Beast volunteers to join the Gold team in pursuit of Apocalypse, because he, Iceman and Archangel have the most experience dealing with him (none of the other X-Men have met him yet), while Quicksilver is put on that team because of his connections to the Inhumans, given Apocalypse was last seen on the moon. Bishop volunteers to remain behind and guard Xavier, which apparently amounts to him standing on the lawn with his guns drawn, randomly twisting around to point the guns at a new spot, which is absolutely hilarious. Reaper of the MLF's disdain for high temperatures is referenced again. X-Force's stolen SHIELD IPAC vehicle finally craps out on them, ending its brief run as their mode of transportation. 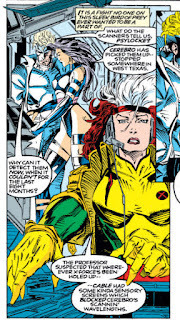 The X-Men/X-Force contingent is able to use Cerebro to track down X-Force, something they hadn't been able to do before; Rogue says Xavier theorized Cable was somehow able to block it previously. 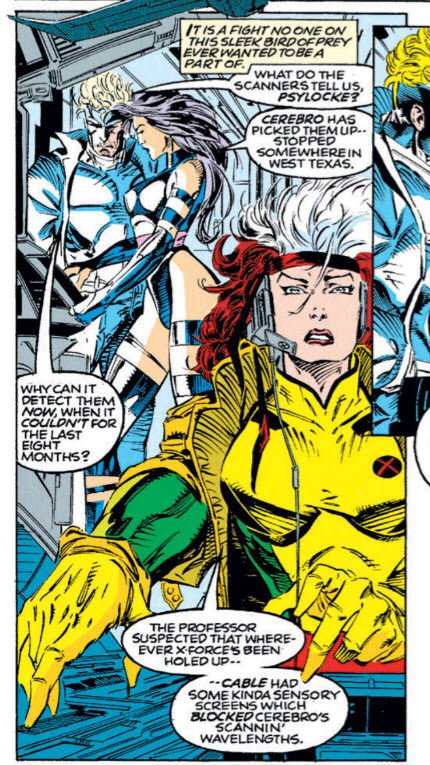 On their way to arrest X-Force, the combined X-Factor/X-Men Blue team debate the merits of X-Force's philosophy and the general idea of the ends justifying the means. Upon learning about the assassination attempt on Xavier, Cable says it never happened, another hint towards Stryfe's time travel nature. 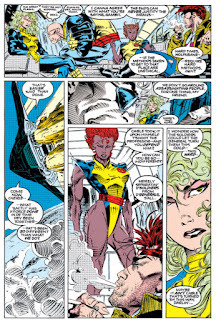 The X-Men/X-Factor contingent recognizes Sunspot's energy type, but is surprised to be hit by it from afar, as he only acquired that ability as of X-Force #15. Jubilee tells Bishop to "party on". Letters in this issue ask the infamous "why doesn't Cyclops wear ruby quartz contacts?" question that seemed to pop a lot around this time, a response to another questions mentions that Excalibur won't be participating in "X-Cutioner's Song" but all the other X-books will (Wolverine doesn't as well), and both the X-Men movie and upcoming animated series are mentioned, with the latter actually well on its way at this point while the former is still nearly a decade out. The larger plot of the story hums along, with Xavier, dying from a techno-organic virus, ensconced in the mansion (where he'll remain for the rest of the story), the third major villain of the story introduced (Apocalypse), Cable returned to the present just in time to learn he's accused of trying to kill Xavier, and the gathered X-people splitting off to run down leads, culminating in a full-fledged showndown with X-Force (following the brief X-Factor/X-Force scuffle in the previous chapter). 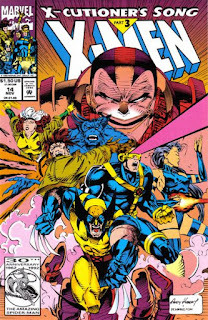 But like Lobdell in chapter one, Nicieza surrounds all these plot machinations with acknowledgements of the the franchise's history and little bits of characterization, things like Beast referencing the fact that, above all else, Apocalypse is the primary foe of the original X-Factor (even if all those members are now, technically, X-Men once again), or Bishop taking it personally for failing to protect Xavier, or just something little like Reaper's hatred of the heat (a sentiment he and I share, and which makes him, outside of Tempo, arguably the most nuanced of any of the MLF). Heck, Nicieza randomly drops Stevie Hunter into the mix; she doesn't do much, but it's nice to know she's still around. Or take the extended discussion aboard the Blackbird regarding X-Force's methods and whether the ends justify the means, and how it helps define the characters involved. 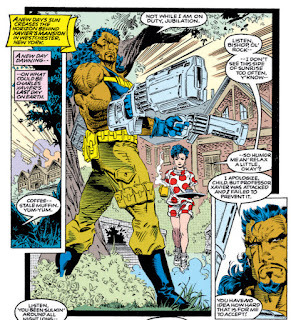 Sure, for longtime readers, the idea that Gambit or Wolverine can justify killing but Wolfsbane is against it is hardly groundbreaking, but in the span of a few panels, any new readers brought to the book thanks to the marketing hype have at least a rudimentary idea of who some of these characters are, as people, beyond just their costumes and powers and roles within the plot. Stuff like that, making the room for moments of characterization, however basic, and acknowledging the shared history of the books, to underscore the sense that what's happening now matters because past events are still having an impact on the characters, is important to making a huge crossover like this feel more like a story and less like the marketing gimmick it ultimately is, that there's more to this than a bunch of interchangeable characters running around punching things. Tomorrow, X-Force battles the X-Men in X-Force #16. Friday, the X-Men team-up with Excalibur in Excalibur #57. Next week, Uncanny X-Men #295. 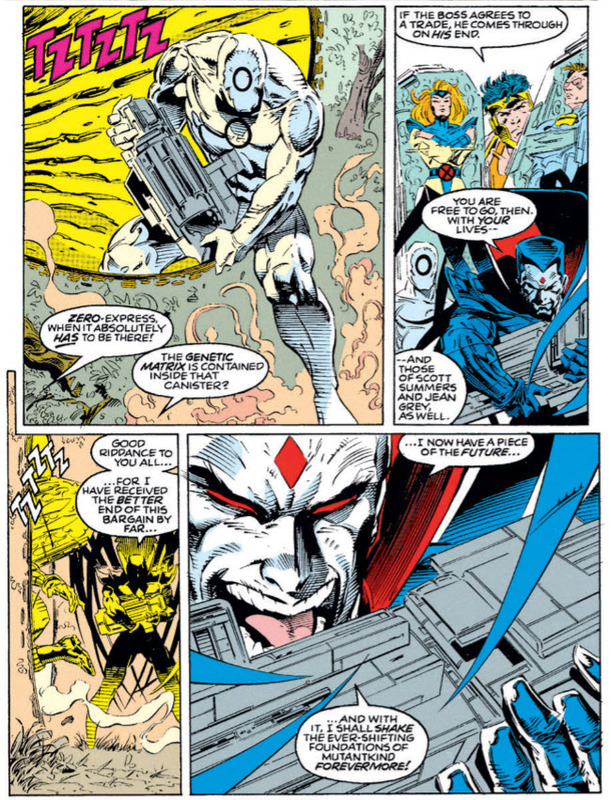 "This is actually the first time we've seen Apocalypse since his apparent death in X-Factor #68, something that never really dawned on me as a kid (kind of like how I was subconsciously unaware of the gap in Mr. Sinister appearances between X-Factor #39 and #75)"
I was the same way when I discovered the X-Men in the 90s. 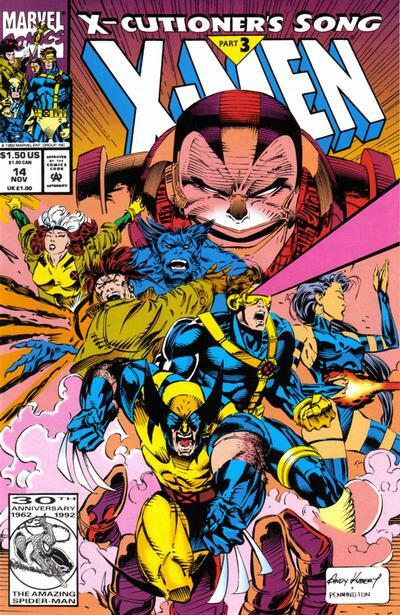 I knew that the X-Men had been around for 30 years, so I assumed a lot of these popular characters and villains (Gambit, Apocalypse, Mister Sinister, Cable, etc.) had been around a lot longer than they really were. It also didn't help that I was friends with a kid who would make a lot of stuff up to sound cool to us. I'll never forget the stories he'd tell of the infamous "Black and white X-Men" live action show from the 60s that had Gambit and Jubilee in it. Imagine my surprise when I found out he was full of crap. But this also speaks to the power of the writing and creation of these new characters that they could be around for maybe 5 years at most and have more impact than characters that were decades old. Aside from Magneto, most of the best X-Men villains came about during Claremont's tenure. 1.) Andy Kubert cannot draw Strong Guy to save his life. Seriously. 2.) 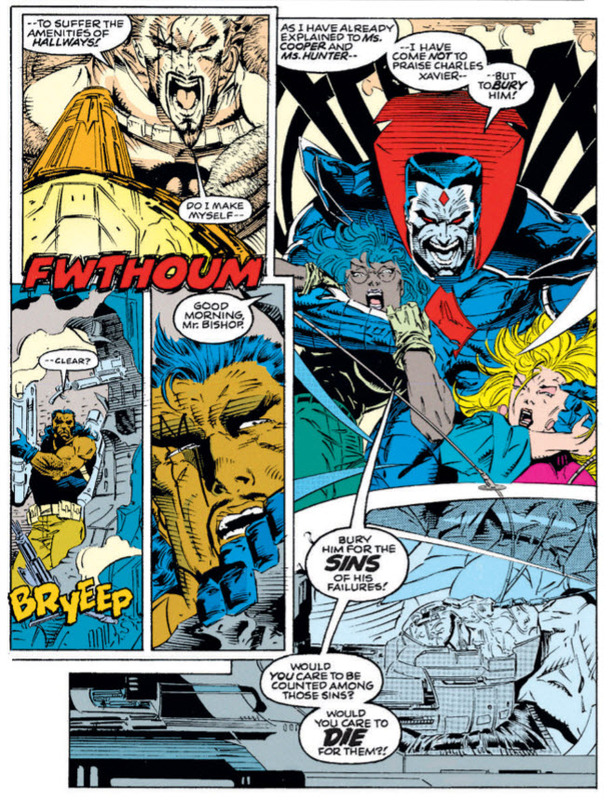 I love the bit where Bishop blows a hole in Mister Sinister's head. In general, Kubert draws a very cool Sinister and is probably my favorite artist to depict the guy. 3.) 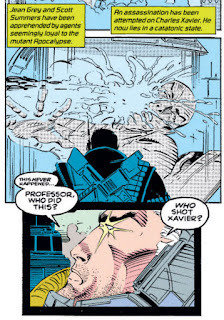 Bishop sort of becomes Xavier's unofficial bodyguard in subsequent years, and I think this may be the start of that. Yeah, you're right about the bodyguard thing. I've never really pegged this as the start of it, but it really is. Also, you're totally right about Kubert's Strong Guy. Ugh. Is there any explanation for why Excalibur was again ignored? One of the reasons that I simply ignored the title during these and previous years was the feeling that it didn't belong to the X-Men universe. It felt like the Champions and the New Defenders that had a few original X-Men in it, but were not part of the X-Men universe. I don't know this for sure, but I believe EXCALIBUR was left out because it's still not part of the X-office; it has a different editor then the rest of the series. Which does make it very much like CHAMPIONS or NEW DEFENDERS in that it features X-characters, but isn't managed by the X-Men's editor. After Alan Davis leaves the book, it gets formally moved into the office, which is why EXCALIBUR is part of "Fatal Attractions" and "Phalanx Covenant" after missing this and "X-Tinction Agenda". Now, I have no idea why WOLVERINE skipped the crossover, since that was part of the X-office. In addition to the fact that EXCALIBUR was handled by a different editor, there was, also, the issue of product availability. At the time, EXCALIBUR was only available in the direct market. The rest of the X-books were distributed through newsstands. In the early 90's, newsstand distribution was a, much larger, part of the comics market. If that was your, primary, outlet for buying comics (as it was for me), it just wouldn't work if you could only get 4 parts of a crossover and not be able to buy part 5. @Cerebro: That would also explain why WOLVERINE was left out, since it too was direct market only, I believe (certainly, it had the higher price point per issue, like EXCALIBUR). @Austin Gorton: Actually, WOLVERINE was available on newsstands (as evidenced by the fact that I have, several, newsstand copies in my collection). Marvel must have had some other excuse for neglecting it in crossovers. While it's true that most of the higher price point Mando series were direct market exclusives, it seems Marvel made an exception for books that featured "bigger name" characters. In addition to WOLVERINE, other Mando books for which I recall newsstand availability were the McFarlane SPIDER-MAN book, GHOST RIDER (and all the Midnight Sons spin-offs), and the two PUNISHER spin-offs, WAR JOURNAL and WAR ZONE. It is an established group name, or at very least the pre-existing concept according to which the group is named is. It would be okay to say that the Three Stooges manhandled you, even if it was only the pair of Larry and Moe who actually showing up to do that. @Matt Yeah, Kubert's version of Sinister made me a fan of the artist and the character as a kid. There's something I like about how he "cleans up" Sinister, i.e. no black lips or fangs. His work here is not his best, but I think it's only behind Capullo in the crossover. I also love that Nicieza isn't above mocking the art every now and then. Also agree with everything Austin says about the characterization. It's all spot on in Nicieza's issues. Which, of course, introduces this story's biggest plot hole: why Mr. Sinister trade Scott SUMMERS for Summer genetic material. Sinister addresses this in X-Men #23. 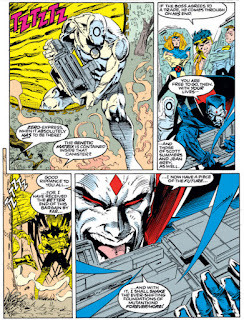 Believing Stryfe to be Nathan, he thought he was getting Stryfe's DNA. ...wow, 25 years of being a fan and this is the first time I've heard that suggestion. But seriously, did the commenter know how hard contact lenses are to put in? You literally have to stick something onto your open eye. Scott can keep his eyes shut while swapping out a visor for glasses, but he'd have to keep his eye open for the contact to go in -- during which point his blast would be obliterating the mirror he was using, the wall that mirror was attached to, the room behind the wall...You get my point. That always felt like a dumb question to me, for exactly the reasons you mention. You have to keep your eyes open to put in contacts, end of story. 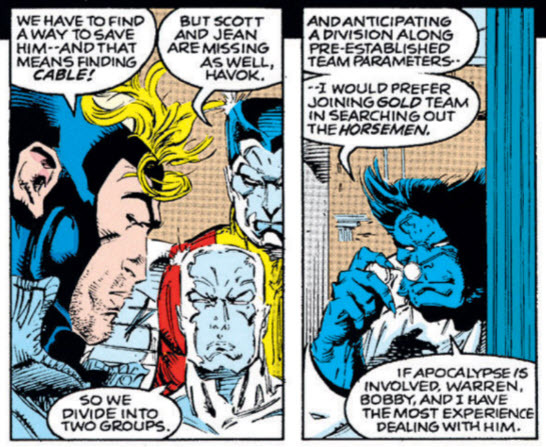 Jean could hold back Scott's blasts though, or Leech could come to help him out when he initially puts them on. Of course, he'd be powerless then because the visor works the way that the ruby quartz slides aside when he needs to blast. Contacts though I understand only cover the iris and not the whole of the (visible) eye, so there's ifs and buts. @Teemu: I also question whether they'd be able to stay in, even if he could get them in without blasting open a wall. His blasts are concussive, and I've always been under the impression that when's wearing the visor, his beam is constantly shooting at the visor and being stopped by the ruby quartz, with the wraparound keeping the force from the blast from launching the visor off his face. So you'd think the contacts would just get sent flying out of his eyes, even if they weren't allowing the beam to go through them. I too have been thinking about that too, but at least his civilian classes don't seem to be flying away and the... things that go behind ears seem to be your regular loose variety. Maybe the gateway to that other dimension that's full of optic beam doesn't open up if the light from our universe's side comes to his eyes only in the ruby quartz tinted variety. I think the explanation is that ruby quartz absorbs the optic blasts rather than blocks them. This would explain how his full power optic blasts could be hitting his visor all the time and not blow it off. I've been biting my fingers to not make the "Mr. S just didn't want to pump it out himself" pun for days now. But, a blood or any sample should be sufficient I think. I don't know though how well DNA survives storage in various fluids. 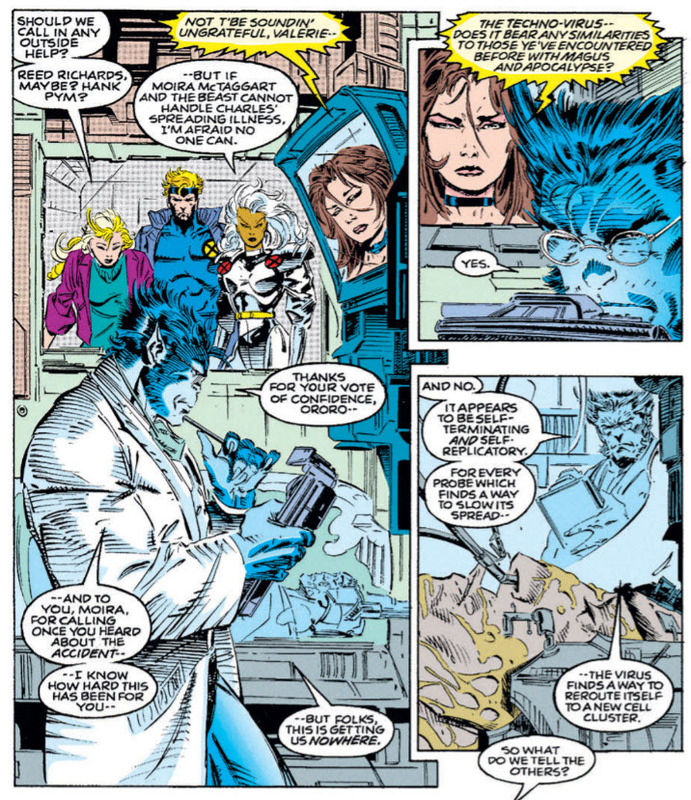 Beast has a specific focus on biochemistry prior to this and whatever happens with the Legacy Virus, FWIW. That seems to come with being named Hank in the Marvel Universe. In fact, Avengers #140 finds the newly inducted Beast providing the serum that Vision uses to cure an unconscious, enormous-and-dangerously-still-growing Yellowjacket, in what no-one 'til now has called "a two-Hanky melodrama".